Avoiding flag football injuries isn�t difficult if you use common sense and follow a few simple rules. As with all athletic competitions, there is some degree of risk associated with flag football, but it�s not nearly as high as the full-contact version of the game. By following these tips on how to avoid flag football injuries, players can maximize their chances of enjoying the game and remaining healthy. While bumps and bruises might still occur, the ultimate goal is to eliminate more serious injuries such as torn muscles and ligaments. 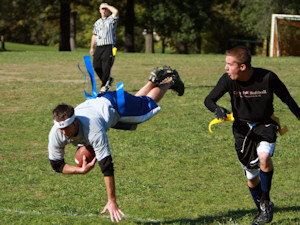 Ultimately, the health benefits of flag football far outweigh the possible risks. Wear the Proper Gear - Although flag football is supposed to be a non-contact sport, it would be wise to wear some basic protective gear. Mouthpieces, for example, are inexpensive, easy to use, and greatly reduce the risk of oral injuries. Knee braces, ankle guards and jock straps are also useful, and these pieces of equipment can be bought almost anywhere with a sporting goods department. While there�s no tackling in football, you may be falling down from time to time, and high-speed collisions on the playing field are not unheard of. It�s also a good idea to refrain from wearing jewelry or clothing with pockets. In fact, many flag football leagues will forbid wearing such items in their rulebooks. Check With Your Doctor - Before taking part in a strenuous activity, it�s not a bad idea to visit your doctor and get a basic physical. Conditions like a hernia or high blood pressure are easily diagnosed, and playing through such ailments can only make them worse. Get Health Insurance – Football – even flag football – is classified as a high-risk sport because of all the running and cutting and twisting involved. Apart from not playing, health insurance is the only way to reduce the risk of landing a serious injury. If your budget prevents you from getting full insurance, you can find private insurance to cover yourself temporarily during football season. Prepare Your Body – Lifting weights, walking and jogging are excellent ways to get in the proper condition for playing flag football. Moderation is the key, as trying to lift too much or run too far can be counter-productive and result in injuries. Stretching is also important prior to a flag football game, as this warms up the muscles about to be used and reduces the chances of sprains and pulls. This should be done about 5 to 10 minutes prior to the start of your game. If you�ve suffered an injury to some part of your body in the past, be sure to take extra care. Chances are that it may be more susceptible to injuries in the future. This is where protective devices like knee braces and wraps come in handy. Practice Makes Perfect – It�s never a bad idea to practice flag football, as being skilled in your chosen sport can also help to reduce injuries. It�s best to practice with a team or partner, as practicing alone might cause you to engage in improper techniques. Know Your Environment – It�s best to play flag football on an actual football field or at least a grass surface. If you�re not playing on a regulation field, be sure to check ahead of time for potholes, debris and other hazards on the field. Stay away from playing on concrete, as it greatly heightens the danger of any fall. It�s also important to avoid drinking alcohol while playing. Certainly, organized leagues will forbid it, and it�s a good idea to do the same in less formal efforts. Drunken players are really asking for a serious injury to themselves or others. Follow the Rules – The rules are there to help everyone enjoy the game, so it�s important to follow them. Moves like blocking from behind or lowering the shoulder while blocking are prohibited in league play, and they should also be banned from informal games due to the increased likelihood of injuries. Drink Plenty of Fluids – During the game, it�s important to drink plenty of fluids. Keep plenty of water on the sidelines, and get a drink anytime there�s a break in the action. This will keep your body hydrated and prevent cramps. Don�t substitute carbonated beverages, as they will have the opposite effect during a game. Stay Alert – Always pay attention to what�s going on during a flag football game, especially if you�re sprinting down the field. Not paying attention while going for a pass could cause a collision with another player, and such things always carry a risk of injury. Constant awareness is an excellent tool in avoiding flag football injuries. Pay Attention to Aches and Pains – If your muscles begin to hurt, be sure to take a short break. It�s a bad idea to try to play through pulls or strains, even if they seem minor at the time. This could end up making things worse, and a severe pull or strain could keep you out of the game for weeks.